The AcquireConnection method failed 0xC001404. 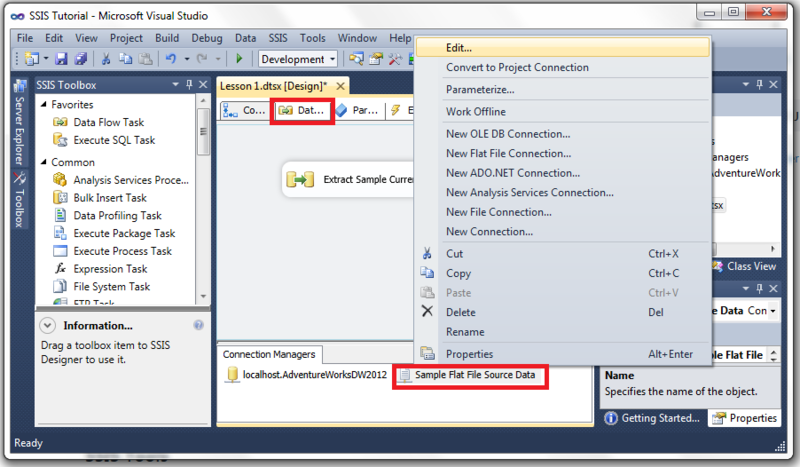 Error at Extract Sample Currency Data [Lookup Currency Key ]: SSIS Error Code DTS_E_CANNOTACQUIRECONNECTIONFROMCONNECTIONMANAGER. 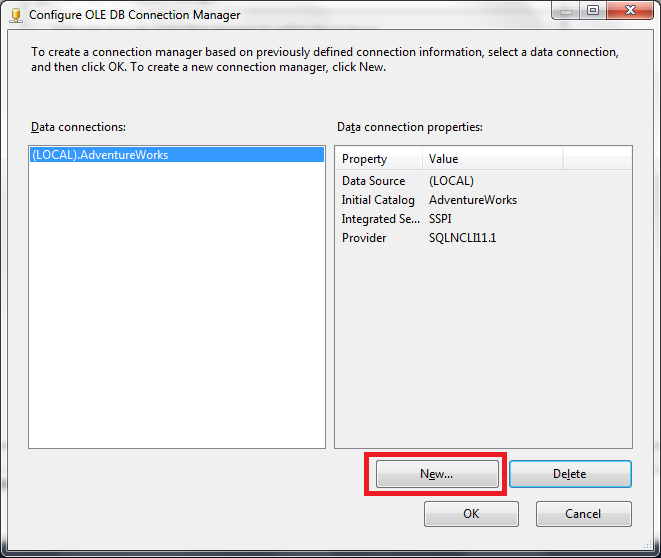 The AcquireConnection method call to the connection manager "localhost.AdventureWorksDW2012" failed with error code 0xC0014041. There may be error messages posted before this with more information on why the AcquireConnection method call failed. Error at Extract Sample Currency Data [SSIS.Pipeline]: Lookup Currency Key failed validation and returned error code 0xC020801C. 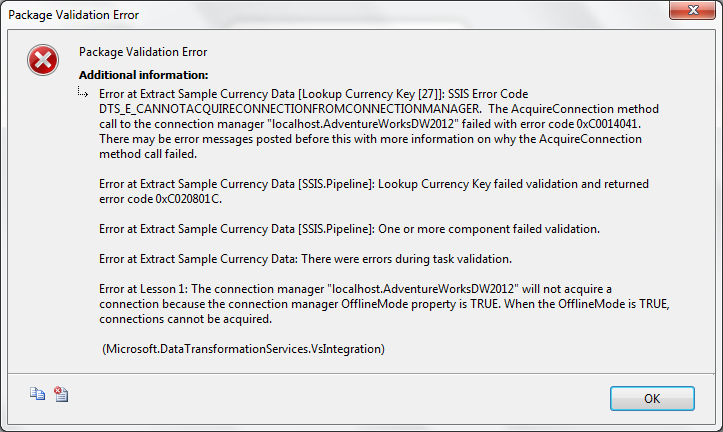 Error at Lesson 1: The connection manager "localhost.AdventureWorksDW2012" will not acquire a connection because the connection manager OfflineMode property is TRUE. When the OfflineMode is TRUE, connections cannot be acquired. 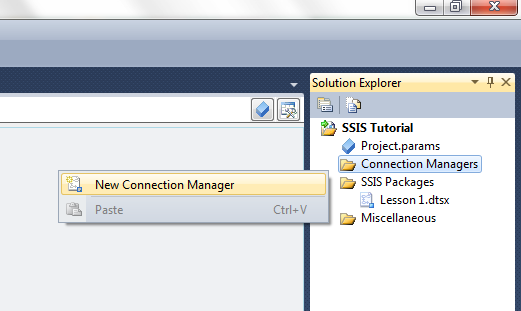 The Lesson1 SSIS package is designed to use an OLEDB connection to the AdventureWorksDW2012 database that should have "localhost.AdventureWorksDW2012" as name. 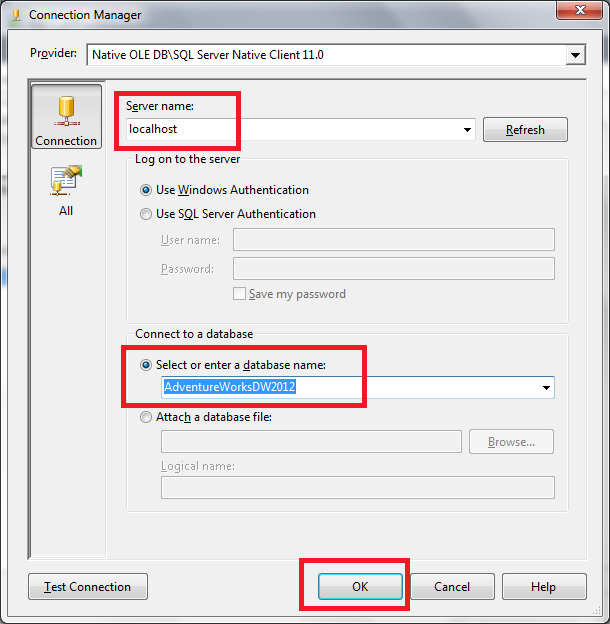 This means the above error is related to a missing OLEDB connection to a SQL Server database. 1. Make a right click on Connection Managers, select "New Connection Manager". 2. Make a click on OLDB and click the Add button. 3. 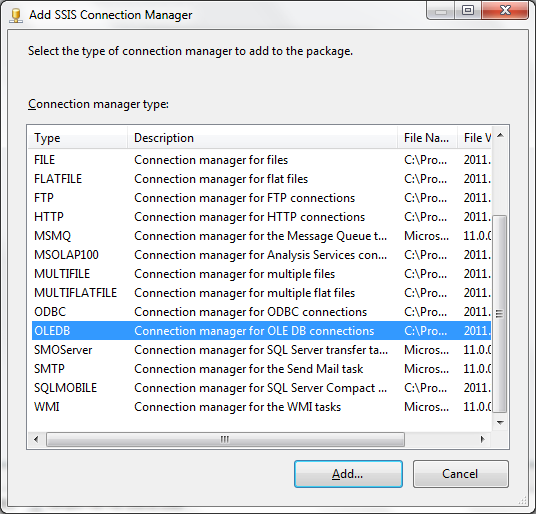 On the "Configure OLD DB Connection Manager" dialog, make a click on the New button. 4. 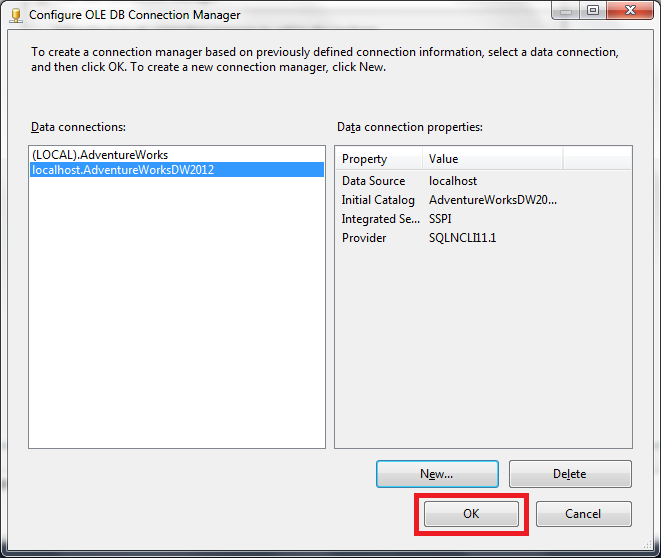 On the Connection Manager dialog, type localhost on the "Server name" combox and type AdventureWorksDW2012 on the "Select or enter a database name:" combo box, then click on the OK button. 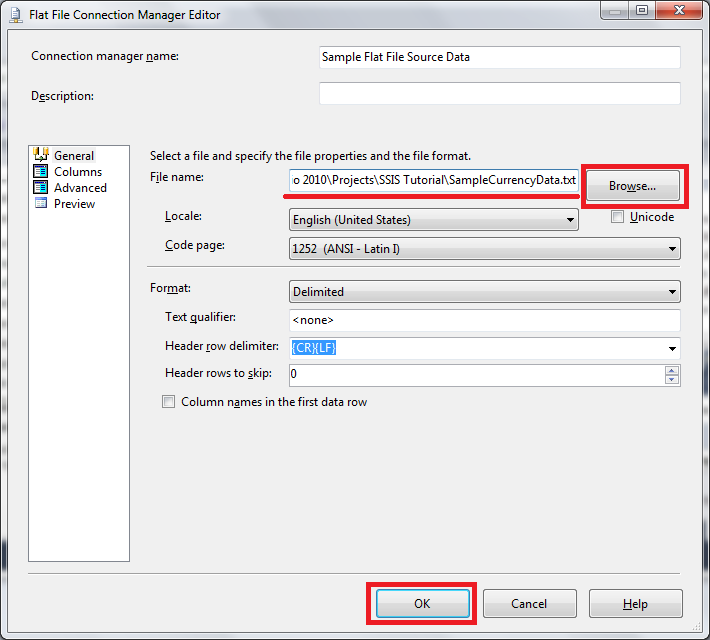 You may need to update the "Sample Flat File Source Data" connection with the location of the SampleCurrencyData.txt file too, for the Lesson1 package be able to run properly. Make right click on the connection and select the Edit option. Then click the Browse button and provide the current location of the file on your computer.